I wanted to share with you the list of equipment that I used to shoot The Great American Cooking Story. When I was planning for the cross-country trip and trying to decide what camera and audio equipment to use, I found it helpful to read about the set-ups of other small, independent video teams, so hopefully this guides other solo filmmakers in preparing for their own projects! Here’s the details on what I filmed with. This equipment was all I used to capture footage during the ~5 hours I had to film in each city. My equipment, laid out on my bunk on the train. 4. Zoom H4N – I mounted this to the top of the camera and used it in place of a shotgun microphone. I set it to 4-channel mode and recorded the lav mic into the Zoom. I also fed the sound from the H4N into the camera for easy syncing in post-production. 7. 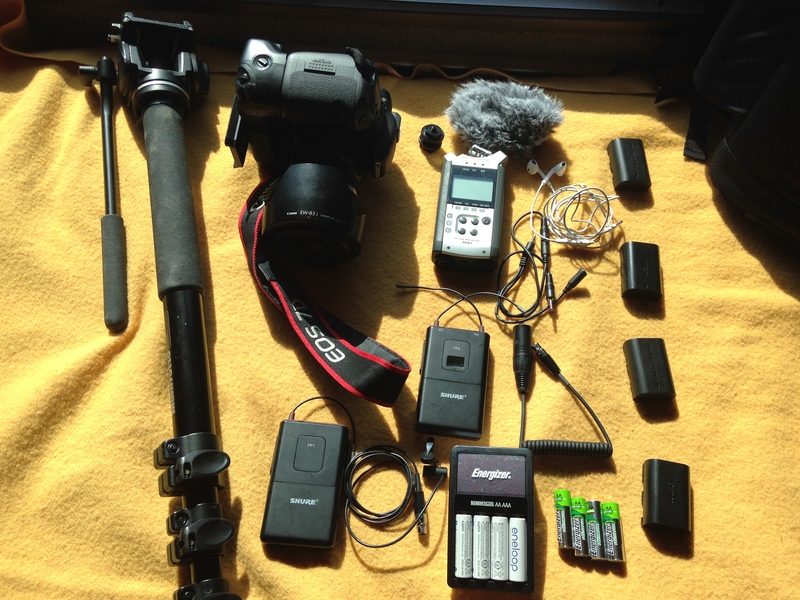 Wireless Lavalier Microphone Kit – I used both the Sennheiser and Shure models during my trip. (Sennheiser is better, but I wasn’t able to keep that set the whole trip.) Because the Canon 7D only has room for one shoe mount, I sometimes clipped the receiver to the back of my backpack or to the neck strap of the camera. Also with me was a water bottle, notebook + pen, chapstick, my wallet and my iPhone 5. I was able to carry all of this with me easily, and the set-up proved to work well for shooting the project on my own. And in case you’re wondering about battery life and card memory, I bought a 1 TB portable hard drive that I kept on the train with me. Every night I’d download the video footage and audio files from the day to the hard drive and wipe the two cards to use the next day. I’d also plug in all of my batteries so that they’d be fresh and ready to go for the next day. What I had was enough to get me through a day of filming. If you haven’t checked out the finished product, start catching up here!